These offers are free with the purchase of the Atlas Voltage 26 (2014) Bicycle. The Atlas Voltage 26 (2014) features a steel MIG welded frame with an integrated carrier and suspension system.The bicycles also features disc brakes. It's 26" wheels, on 26T x 2.35 double wall alloy rims ensure a sturdy ride on bumpy roads and mild rugged riding conditiond. The Price of the Atlas Voltage 26 (2014) is Rs.6522. 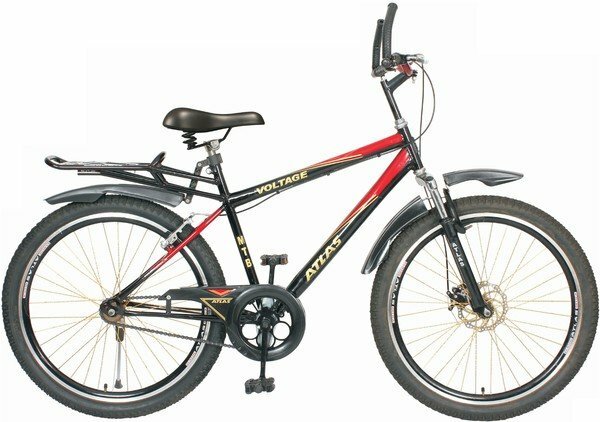 The Atlas Voltage 26 (2014) is a great bicycle for children aged 9 years and above, as well as young teenagers looking for a cycle for commute and fitness, that can handle rugged roads with ease. 2. In what condition will I get the Atlas Voltage 26 (2014)? 6. How will I know if Atlas Voltage 26 (2014) will fit me without riding it? 7. How long will it take for me to receive the Atlas Voltage 26 (2014)?